New Holland has completely redesigned the heavy duty six to nine metre LM range of telehandlers, which now delivers substantially improved performance together with premium operator comfort. The five model range features the LM 6.32, LM 6.35 Elite, LM 7.35, LM 7.42 Elite and LM 9.35 models, can lift up to 4,200kg and has a maximum lift height of 9.1 metres. The range benefits from in-house design and construction, and is set to offer the world’s medium and large scale livestock farmers, large arable operations and contractors, high performance material handling capabilities. The new range replaces the existing LM5040, LM5060 and LM5080 models. In order to highlight this, the LM range benefits from New Holland’s evolution in product numbering. The first digit indicates the maximum lift height in metres, and the second two numbers denote the maximum lift capacity in hundreds of kilos. The entire LM range has been equipped with New Holland’s renowned NEF engine, which features ECOBlue™ SCR solution for Tier 4A compliance, that delivers outstanding performance and exceptional fuel economy when compared to current models. Standard LM machines develop up to 121 maximum horsepower, which rises to 143 on Elite models. This prodigious output enables maximum lift heights of 6.1 metres on LM6.32, 7 metres on LM7.35 and 9.1 metres on LM9.35 models to be reached easily. Lifting performance is maintained thanks to the heavy-duty boom construction. Manufactured using high tensile steel, the large pins and pads further enhance operating durability. The range-topping LM9.35 has been conceived with modern straw-focused operations in mind, which need to stack bales in the tallest modern sheds with inch-perfect accuracy. 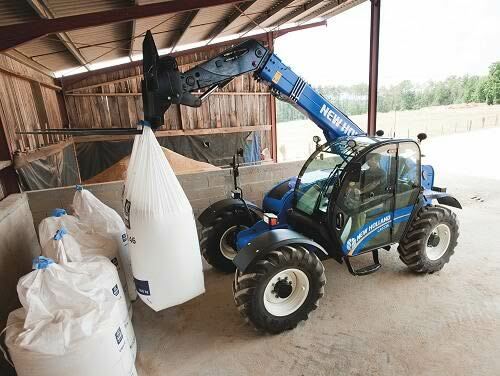 Today’s modern agribusinesses demand the ultimate in lift capacity, and the LM range offers from 3,200kg right through to 4,200kg to guarantee that even the most demanding arable contractors can lift the largest grain buckets with ease. The Elite models have been conceived for the most demanding operations as the LM6.35 Elite can lift 3,500kg, 300kg more than the standard model and the LM7.42 Elite can lift up to 4,200kg, 20% more than the standard machine. The 131° of tilt on standard models, which rises to 142° on Elite models, ensures that buckets are fully emptied, even when working with the stickiest crops. The LM’s impressive cycle times have been improved thanks to the upgraded hydraulic capacity. Standard models deliver 120 litres per minute with the Elite variants’ output reaching 140 litres/minute. This maintains productivity even when the heaviest loads are transported to full height and significantly speeds up grain handing cycle times. The LM’s cab has been upgraded and now features best-in-class visibility to facilitate all handling operations. All key controls have been grouped together for ergonomic operation and all principal boom functions are controlled via a finger-tip electronic joystick together with gear shifting and neutral engagement. In cab is also noticeably quieter for enhanced comfort during long operating days. On Elite models, the joystick has been positioned on the armrest, and features additional forward and reverse controls to further enhance day-long operator comfort. The 4x3 powershift transmission on standard models has been tailored to offer the perfect spread of speeds across the working range whether stacking bales, trailer transport or working on the silage clamp. The Elite models have been designed with transport focused operations in mind, as they feature a 6 x 3 powershift transmission with auto shifting functionality. Operators manually change through gears 1-4, and auto-shifting engages to automatically select gears 5 and 6 to ensure the most efficient gear is always selected. This significantly improves operator comfort and reduces fuel consumption during road transport. The maximum transport speed of 40kph is combined with improved tractive effort. This maintains performance in varied working conditions including during in-field tasks as well as sustaining performance when transporting heavy loads on undulating roads. Precision handling has been made even easier thanks to improved structural rigidity. The entire chassis has been stiffened to reduce flexing during delicate handling tasks and the integrated oil tank further improves balance, ideal when working on steep silage clamps. Furthermore, the front attachment has also received a significant upgrade to ensure compatibility with a wider range of implements and to assist super-fast hitching. Elite models also feature automatic steering alignment which ensures that all four wheels are perfectly aligned to enhance steering accuracy and to reduce tyre wear. The LM range features a unique under hood configuration which makes carrying out daily maintenance even simpler and tool free. . The bonnet opens wide and all service points can be reached from ground level. During intensive operation in the dustiest environments, the reversible fan keeps grills free of debris to maintain productivity. The once time consuming job of adjusting the telescopic boom wear pads has been simplified by use of a new simplified system, a simple nut screw and lock nut system makes adjustment quick and easy, without the need for special tools. Moreover, these pads significantly extend the life of the machine and reduce productivity impacting downtime.